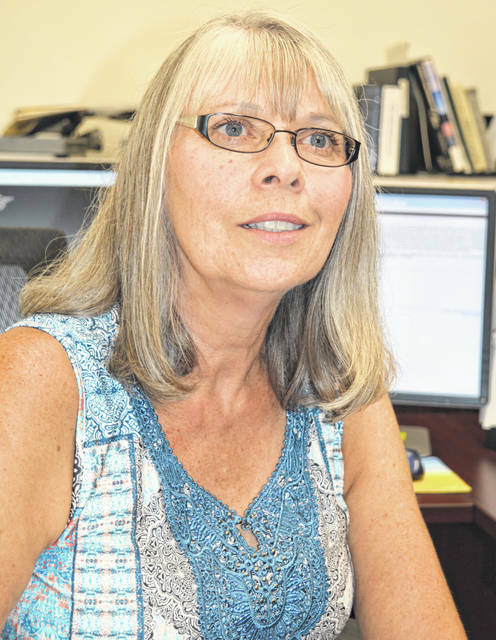 Clinton County Recorder Brenda Huff wants her former staffing level restored. From left, Clinton County Prosecuting Attorney Richard W. Moyer and Office Administrator Kelly Shoemaker prepare to discuss the prosecutor’s office pending 2019 budget. Clinton County Sheriff Ralph Fizer Jr. makes an appeal Monday for funds to acquire a body scanner for the Clinton County Jail. A body scanner is utilized to detect drugs that are being smuggled into a detention facility in a person’s body cavities. WILMINGTON — On Monday while reviewing the county recorder’s budget proposal, county commissioners heard that the $5,000 requested in the Legal and Consulting line item is for potential legal action against them. As reported in July, Clinton County commissioners reduced funds for the County Recorder’s Office after a full-time worker there retired and the recorder declined a commissioners’ proposal that a new hire be shared with two other county offices. 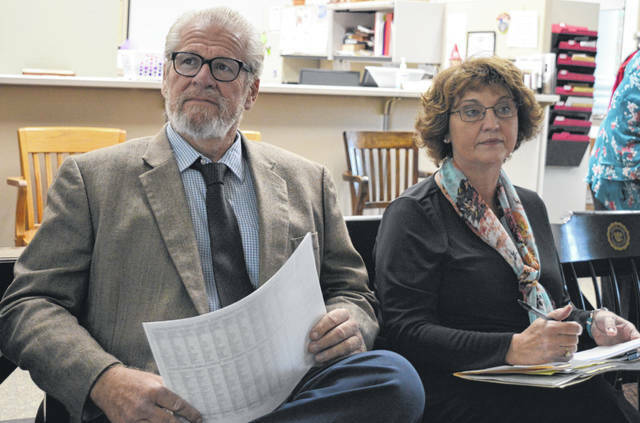 During Clinton County Recorder Brenda Huff’s appointment Monday with commissioners to discuss her office’s 2019 budget request, Clinton County Commissioner Kerry R. Steed noted the proposed increase in Legal and Consulting expenditures and asked for clarification. “That’s for litigation,” replied Huff. “OK. Alright, is there a need within your office right now for litigation caused from some of the customers in the office?” asked Steed. “It’s against you [board of county commissioners],” Huff said. A short while later in the meeting, Clinton County Commissioner Brenda K. Woods asked Huff whether she could send commissioners the total number of recordings that the county recorder’s office processed in 2017. After indicating she would, Huff asked Woods whether she could tell her what she wanted the number for. Woods said it’s for a comparison with other counties that are similar in population in order to see how things are at the recorder’s offices in other counties. Huff said she has heard from other county recorders who were contacted by Woods, and she figured that’s what the requested number was for. Woods responded that making comparisons is the type of thing she likes to do. “It helps me a little bit more in understanding what everyone else, in comparison to our county, actually is doing — the number of employees and that type of thing,” added Woods. Huff asked whether Woods in return could share with her who the other counties are, and Woods agreed to and said she also would give Huff a copy of the comparison when completed. Later Steed asked the county recorder what things she foresees as changes in the office, or things that could be implemented at the office over the next one, three or five years. “Not with the current staffing I have, no. I’ve done tremendous things in my office with the staffing I have. I’ve saved the county thousands of dollars by doing it ourselves,” Huff said. In other departmental budget meetings Monday, the prosecuting attorney’s office would like to give its staff members a 3 percent pay increase, and two staff members who have been with the office “for some time and have done an excellent job” it would like to increase by 6 percent, said Kelly Shoemaker, the office administrator. The county prosecuting attorney office is seeking to add a full-time felony prosecutor and a part-time administrative staffer. Clinton County Prosecuting Attorney Richard W. Moyer reminded commissioners he had spoken to them in February about adding a third full-time felony prosecutor. There are more than 600 felonies a year now in Clinton County, said Moyer, with two attorneys carrying that case load. Regarding the requested 3 percent raise for staff, that’s basically what is needed for the staffers to maintain purchasing power due to cost of living, said Moyer. 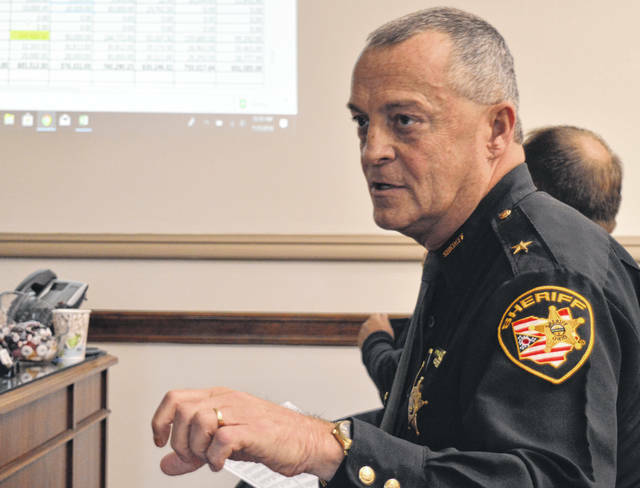 Clinton County Sheriff Ralph Fizer Jr., during his session with commissioners, said a new transport van is almost a must. The current vehicle, which is used to transport convicted people to state prisons, already has a lot of mileage, he said. The sheriff also made a plea for funds to acquire a body scanner for the Clinton County Jail. A body scanner is utilized to detect drugs that are being smuggled into a detention facility in a person’s body cavities. Fizer spoke to commissioners in February about a body scanner, and commissioners have not as yet secured as much grant money to go toward the expensive equipment as they had hoped.